How PV solar panels and cells work? PV (photovoltaic) solar panels use rows of solar cells, made of a semiconductor material that reacts with sunlight to produce an electric current. This electricity is then distributed around the property to power appliances and lighting, or if surplus to requirement, it is sold to the National Grid network. 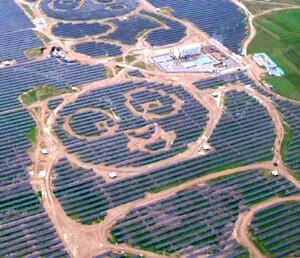 The solar cells are the power stations of every PV system. PV solar panels (photovoltaic) have had an unexpected benefit. They increase the value and sell-ability of your home. This situation only applies if you install the solar panels yourself. Companies which offer free PV solar panels, and rent your roof space, will have the opposite effect. You do need to make sure that you own the PV solar panels because solar panels offered by a free solar panels company will quickly become a white elephant for anyone selling a property which has solar panels held by a third party. A PV solar panel installation makes a house more desirable to any future home buyers if it is part of the property than one with free solar panels, which is not. Also, estate agents have seen averagely priced properties with solar installed selling for up to 5-10% more than properties without PV solar panels. PV solar panel (photovoltaic) installations are growing with the feed-in tariff scheme, but why? Global oil prices hit a two year high yesterday, with warnings that the soaring cost of raw materials could put the brakes on the U.K’s economic recovery. Solar panel installations are growing with the feed-in tariff scheme, but why? Crude oil pushed above $120 a (46.6p) per barrel after concerns that continued fighting in Libya, unrest in Yemen, forthcoming elections in Nigeria, one of the world’s biggest producers and the prospect of a resurgent US economy would put pressure on supplies. Germany is the world leader in the implementation of PV solar panels (photovoltaic) into its everyday infrastructure. In fact, it was a train journey to Salzburg in 2003 which persuaded me that PV solar panels were the future, to quote a horrible cliche. They were everywhere, and so after getting home and researching why, I found that Germany had, in fact, been promoting solar panels through their pioneering feed-in tariff scheme since 1997.